The Champlain Residential Centre was merged with other centers of the territory, the CLSC’s and the Hospital of Verdun into a collective entity called the University Integrated Health and Social Services Center of the Southwest of Montréal. Inaugurated in 1976 as a short-term and long-term care residential home, the Champlain Pavilion (Champlain Hospital of Verdun) has witnessed this mission advance substantially since. Already in 1978, the remodeling of the physiotherapy service and the acquisition of modern equipment made it possible to serve a clientele of work-accident victims. Following the Day Hospital in 1989, the fiduciary responsibility of the Southwest Mobile Dental Health Clinic for the elderly in institutions (1988), as well as the opening of the Clinic of work accidents and occupational diseases and of the Occupational Therapy Unit in 1990. The capacity was, at the time, 112 beds divided into 32 acute care beds and 80 long-term care beds. Since 1985, substantial steps have been taken to increase this capacity. As a matter of fact, construction work began as early as July 1993 and was completed in February 1996. 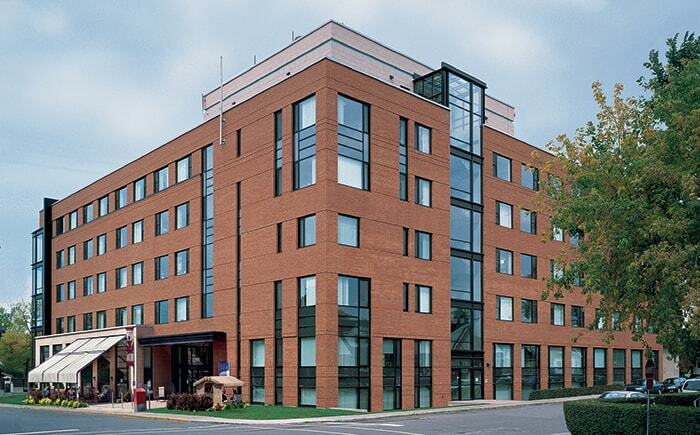 The capacity of the Champlain Residential Centre is now 228 beds. To continuously provide alternative living, housing, assistance, support and supervision services, as well as rehabilitation, psychosocial, nursing, pharmaceutical and medical services to adults who, due to their loss of functional or psychosocial autonomy, can no longer remain in their natural environment, despite the support of those around them. To offer the services of rehabilitation to an external clientele. The organization supports and participates in activities promoting health and collaborates with educational institutions to train health and social services workers. The geographic territory that is served is the southwest district of the island of Montreal, namely: Verdun, LaSalle, Ville-Émard, Côte Saint-Paul, Pointe-Saint-Charles, Saint-Henri, Lachine and Ville St-Pierre. Certain service fees including those related to hairdressing, podiatry, telephone and cable are assumed by the users or their respondent. The center’s staff offers free laundry service; however, washers and dryers are available to users or their respondent if they wish to do their own washing. A dentist and denturist are on site for residents who require it. These services are at the expense of the residents. Our teams are trained and supported by specialized staff (including specialized education technicians) to develop approaches and activities tailored to residents with cognitive deficits. The medical service team provides regular visits and shares medical daycare services in both the Champlain and Manoir-de-Verdun Residential Centres.